A Nigerian lady identified as Opeyemi AanuOluwaseyi Bello has cried out after buying an unidentified fish from a seller she has known for a long time. Accordingto her, the seller has new species of fishes and her curiosity in trying something different led her to buying one. The lady described the head of the fish as being snake-like even though it has scales all over the body. The attendant she met at the shop could not help with the identification of the fish either and this made her even more curious. 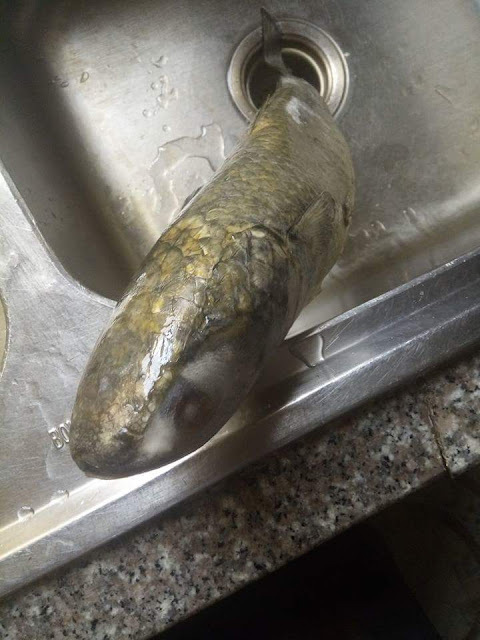 In a bid to find out the name of the fish and the family it belongs to, the user posted pictures if it on her Facebook page while imploring people who might have seen the fish before to help her with the name. The unidentified fish bought by the poor woman. Source: Facebook, Opeyemi AanuOluwaseyi Bello. Not knowing the name of the fish in addition to its features have made her scared of eating it as she said she does not know what to do with it. Pending the time she finds out the name and what kind of fish it is, the poor woman resorted to putting it in the freezer. 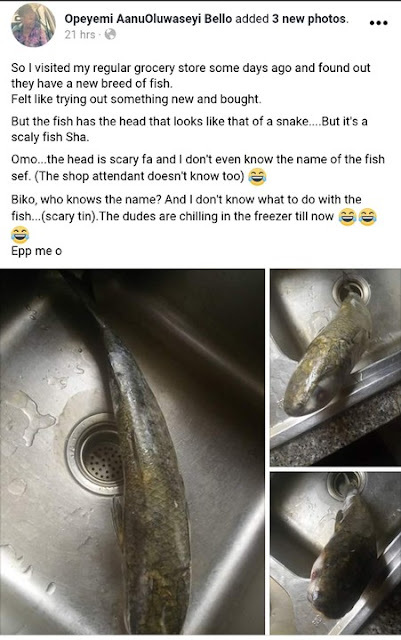 Lady shares photos of the fish she bought. Source: Facebook, Opeyemi AanuOluwaseyi Bello. So I visited my regular grocery store some days ago and found out they have a new breed of fish. Felt like trying out something new and bought.